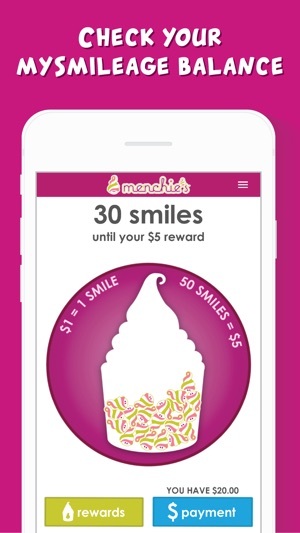 Manage your Menchie's mySmileage account with the Menchie's Frozen Yogurt App. 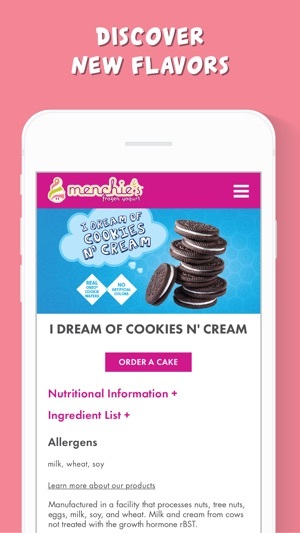 Order Menchie's Frozen Yogurt Cakes using your app and pay using your Menchie's Payment Account. 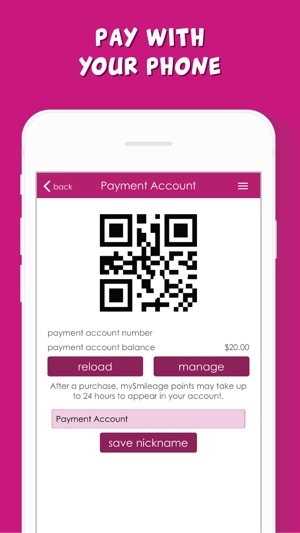 Easily pay for fro-yo using your Menchie's Payment Account. Use the "Find" feature to locate your nearest Menchie's, view the store hours, and easily contact the store. 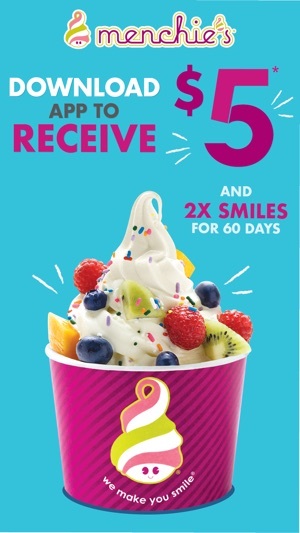 Send a Menchie's e-Gift Card to a friend! After your visit to Menchie's, submit your feedback and earn Smiles with the convenient store survey. We've made some minor updates to help things run smoothy and improve user experience. I love this new app. It’s like my often used SBUX app. It shows how many smiles I have and how much Menchie’s money I have as well. It allows me to use a barcode instead of telling everyone at the store my phone number. 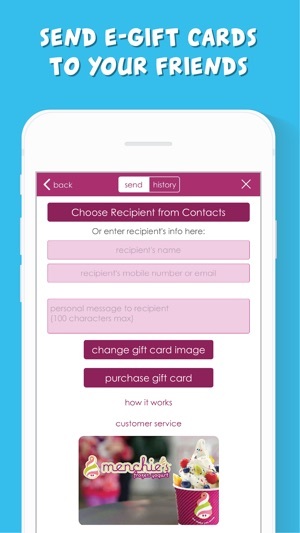 I can also add money to the app so that I never have to take out my credit card. 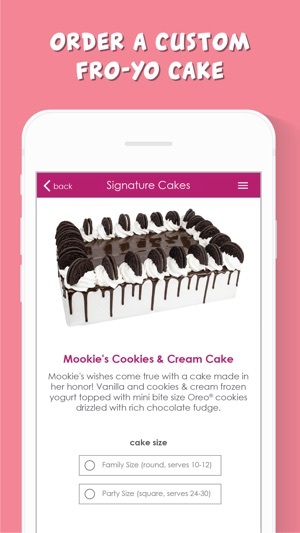 I can also order frozen yogurt cakes through the app!!! Their cakes are so good!!! I believe not all locations have the online cake ordering service available but the stores closest to me do and I can’t wait to order for my next celebration. I was trying to create an account and it took forever so I just gave up!! Thought I should let others know that I'm very disappointed in this app! I was trying to create an account and it took forever for things to load! I noticed that others were having the same problem...very disappointing. It logged me out several times and I had to restart. Not happy that I just wasted an hour of my time. Thanks Menchies for everything! Okay so now I'm writing again a day later after the "fixes" have been made. Well now I'm tryibg to create my account again and now there is and error I tried multiple times and still saying Error. I truly believe they did not make these "fixes"
Every time I open the app it tries to convince me to create a payment account. I don’t want to add funds to my Menchie’s account. Support Apple Pay and give me a self checkout option. The flavors selection is useless. It doesn’t tell you why flavors are currently at your selected location, it just tells you ALL the flavors Menchies could possibly have. If you select one of the flavors, the app bounces you out to the internet for more info (hint: keep users in the app).